Just Romantic Suspense: I Love Food. Congratulations to "Erin F", the winner in Maureen's giveaway. Thank you to all who participated! People often ask, "Where would you go if you could go anywhere on the planet?" Well, heck, that's simple. Hot Dog Johnny's in Buttzville, NJ. Seriously! 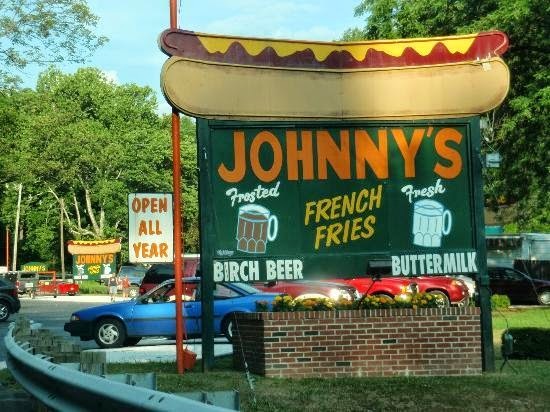 Those from New Jersey might remember this essential family stop on Route 46. I have since moved away from New Jersey, so when asked that question....Hot Dog Johnny's is the spot! It doesn't have to be fine dining in Europe. A trip to the local pizzeria is as memorable to me as any exotic meal abroad. I love food! Today I'm giving away a quick little $5 Amazon gift card so you can buy yourself a book or two, or even a hot dog. I'm sure Amazon is selling hot dogs by now. I'll probably be able to have Hot Dog Johnny's delivered by a drone soon! Sophie's boss has skipped town, abandoning their counseling firm. Now a stranger is stalking her. In an attempt to flee him, she seeks a new job...in London. Does The Shadow really have evil intentions, though? Is there more to him than Sophie originally thought? Maybe The Shadow is in fact her only protection. I already live outside of the US (Canada), but would love, love to visit San Francisco again...so many choices there! I live in Europe but I'd love to go to the US one day. What are some of your favorite meals served at the restaurants near you, Natalija? That would be beautiful, Robin. I would definitely eat at a table outside there to soak it all in! Oh Sue, you're making me hungry just thinking about San Francisco food! Ah, a blog post about one of my favorite topics :D Lovely to 'see' you today - and thanks for a wonderful blog site. I like a traditional roast - roast beef, yorkshire puddings and all the veg! I loved eating in New Orleans pre-Katrina. From Commander's Palace to Mother's, you couldn't get a bad meal. Miss it. Hi Jonetta. I haven't been down there since the hurricane. That is a town that loves to eat as much as I do. I don't think you can keep them down for long! A woman after my own heart! My family and I love to try new restaurants. My fave recently was Smoky Bones. Talk about great food! I am going there for my birthday in a couple of weeks. I do have to mention, however, King Gyros. It is locally owned and operated and has the best gyros and barbeque ribs I've ever tasted! Oh, gyros! Yum! I'll come with you, Debbie! I would love to visit London some day and see all the historic sights. One of my favorite places to eat is at a local pizzeria. Meet some friends with a bottle of wine and you have a great night. One day I hope to visit Ireland... as for fav places to eat... When I lived back East I loved Frank's Pizza in my hometown... he came from Italy... what delicious pizza and calzones. Calzones! Now my stomach is poking me from the inside, saying, "eh-hem. A calzone would be real nice about now." Hi Cindy. So happy to see you! Pork roll! Pork roll and the freshest bagels you can imagine. I recently traveled up to New Jersey for Christmas and even the hotel I stayed in had the best bagel I'd ever tasted. Someday I hope to visit Australia and New Zealand. My favorite places to eat locall are the small "mom & pop" restaurants. Good food and the staff are friendly and even know who you are after a few visits. I'd go to my friend's home - she makes the best dumplings. Dumplings! Perfect comfort food, Mary. I live in Australia, so already outside the US. How about London? What are some of the best local meals served around your way, Mary? I'd love to see London :) thanks for sharing! Great picture! Makes me want a hot dog...right there. But, I would like to visit France. Isn't it amazing that a picture of a building can set your mouth to watering?! :) Thanks Jan!